The Nike Women’s Marathon is a dream for every female runner. A luxury expo experience with facials, makeovers, and fashion shows. A sports bra exchange on course. No medal, but a Tiffany necklace instead. Tuxedoed Fireman at the finish line. 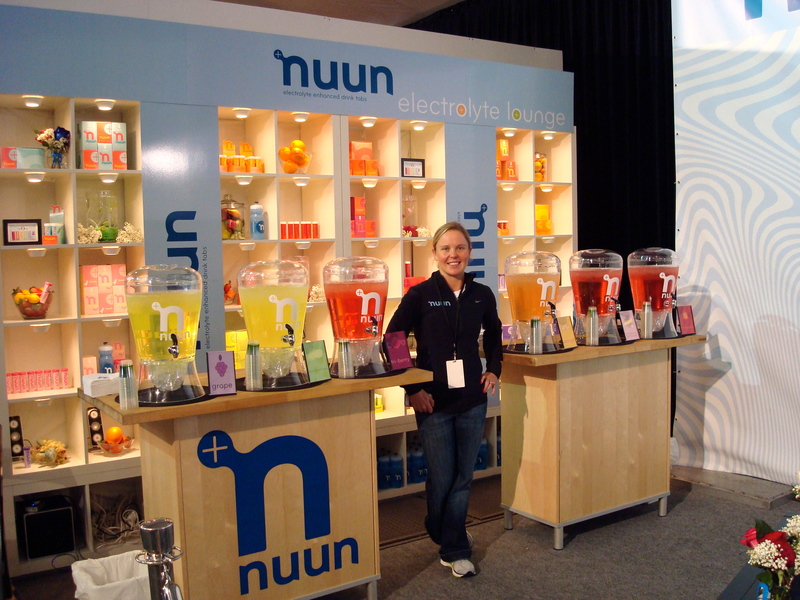 So, from the moment we found out Nuun would be the official hydration sponsor I was hoping to run this legendary race. Yes, this was before Ironman Canada, before the bike crash, and before Lake Stevens 70.3. It was definitely before my hip started hurting from marathon training. And it was also before I came down with a terrible cold the weekend prior. So – back to the summer when we received the awesome news – I registered with my colleagues that would also be working the expo Weds, Thurs, Fri, and Sat leading up to race day. To say the week leading up was busy would be an understatement in a massive way. I already mentioned the sick, but I arrived Wednesday morning (my birthday) after waking up at 3:45 to get in a swim session, to set up the booth from about 9:45am – 6pm. The booth looked amazing, as you can see, but man was I tired! Thursday I woke up early to swim and run, and then worked from noon – 6pm. Friday I ran and worked from 10am – 4pm and then went to some awesome sponsor events where I stayed up about 4 hours past my bedtime and drank one two three drinks too many. And Saturday I “rested” by working from 8am – 8pm including teardown. 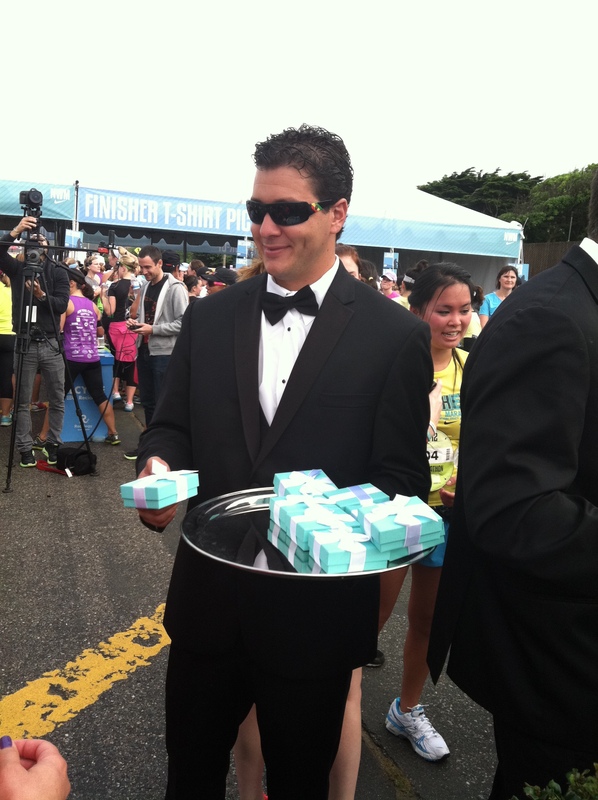 Working meant giving 25,000 runners – plus a few drifters who happened their way into the booth – Nuun 101, teaching them about hydration, and wishing them an awesome race. It’s not like I was laying concrete for 4 days, but after being on my feet for that long my heels were sore, my legs were tired, and my brain was toast. When I woke up on Sunday morning it was really challenging to get excited about running 13.1 miles with hoards of enthusiastic runners. As you can see this was not my best race. But that was never the plan, so onward and upward! The course started at Union Square, spit us out on Embarcadero where we ran along the water, through Fort Mason, through the Presidio, then a loop through Golden Gate Park, then we finished on the Great Highway. Golden Gate Park on the left, and maybe the Presidio on the right? 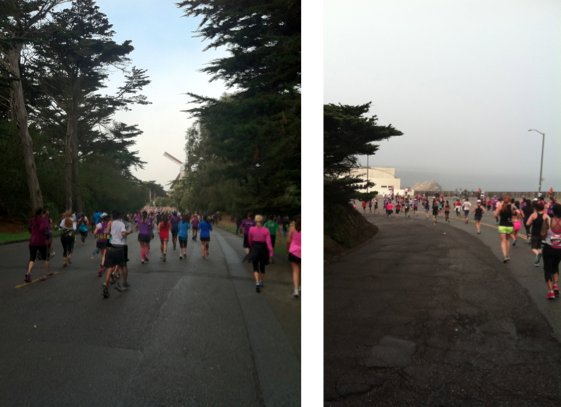 Not sure because I didn’t take these photos and all I could see when I ran through was fog! This was the hilliest run I’ve ever done, and though the uphill sections were long and brutal it was the steep short downhills that really killed me! Not even my quads or knees, but my feet. By mile 6 I knew that this had happened, but I just couldn’t stop to take a look. If I stopped I wasn’t sure if I’d start running again and I really didn’t want to be stranded in the middle of the park. Though I did hear that people saw buffalos in those parks! So I continued to run through it. An aside: feeling the skin on the bottom of your foot move with each stride is puketastic. Beware. 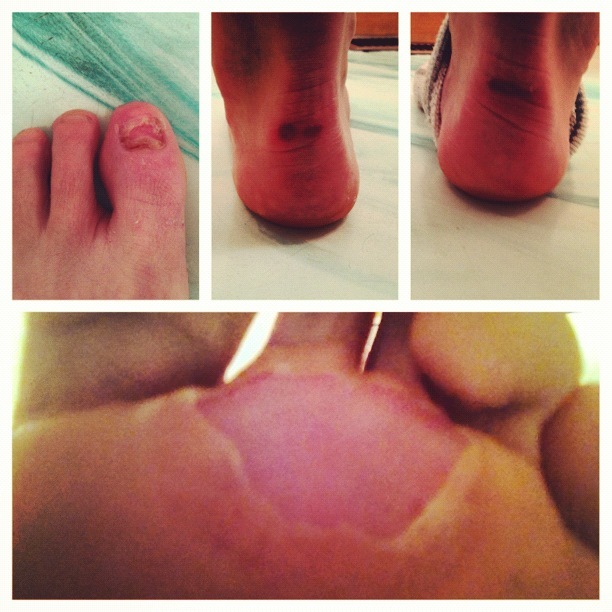 Gross runner foot photo below. By the time I got to the finish I was DONE running. D.O.N.E. My foot was absolutely killing me, and though the course was beautiful and the spectators were fun my heart just wasn’t in this one. I wanted food. I wanted to sit down. I wanted sleep. I wanted warm and dry clothes. So I got my necklace, entered the VIP tent where we received the best post-race greeting imaginable (hot delicious breakfast and bottomless mimosas), and celebrated with colleagues and friends. The fish and chips and beer that we continued our day with a couple of hours later didn’t hurt either. And neither did the 10 hours of sleep I got that night. Would I recommend NWM to others? Definitely. But I wouldn’t recommend it after working the Expotique. 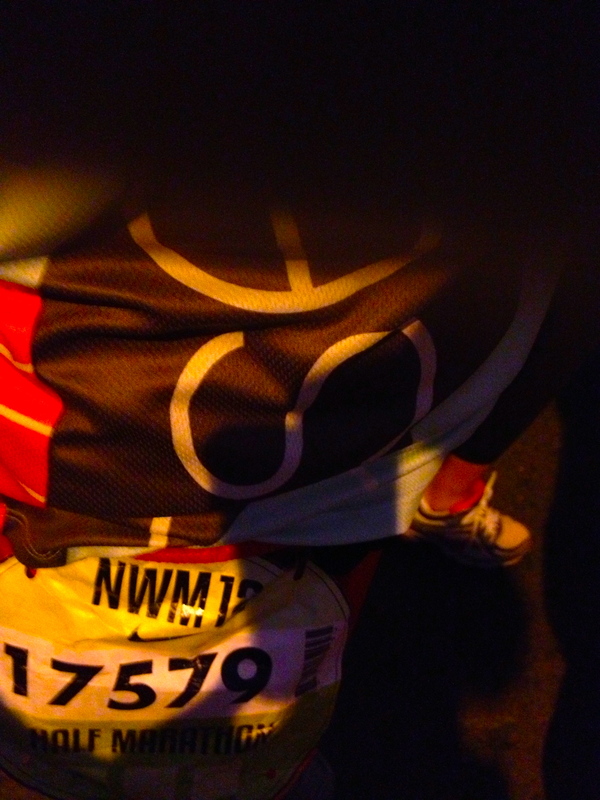 And – you can quote me on this – I don’t think I’ll ever run a race after working such an intense Expo(tique) again! I’ve said it once and I’ll say it again, I just don’t enjoy toeing the line when I don’t have a fair chance at feeling awesome.